I haven't posted in an age. And the longer the time stretches out since that last post, months and months ago, the harder it gets to start writing again. Blogging is chock full of do's and don'ts. Experts all around explain the importance of SEO, of building community, of being consistent, of being yourself, of strategy, and on and on and on. All the rules overwhelmed me. Every post turned into a challenge to do something different, something that stood out from the pack, or really expressed who I am deep down as a person, or showed my marvelously quirky personality. As though I really know myself all that well and can express it in pretty pictures and words or am all that quirky and visionary and unique. But I want to write. I want to think about things that I care about and express ideas about them, whether they be food, art, literature, nature, or the thousand other things that are dreamt of in my philosophy. I think I need to get away from the do's and don'ts and start over. I need to post imperfect pictures, meander to and from my topic, and simply enjoy this blog again. It won't be perfect. It won't always be about food (perhaps it will rarely be about food). Hopefully it will be fun, thought provoking, funny, informative, and interesting for me and for you, dear reader. I am starting back with a recipe today. This one is for homemade cream of cauliflower soup, a rich, creamy dish that still warms the air here after dinner. When I was a child, my favorite soup was cream of cauliflower soup made with a powdered soup mix from the store in Sweden. I've never found that kind of soup here in the United States, and even if I had, I rarely make anything packaged now. But I wanted my son to try this soup because I always loved it so, and I thought he might as well. I've tried a few different recipes, but I think this one is perfect. 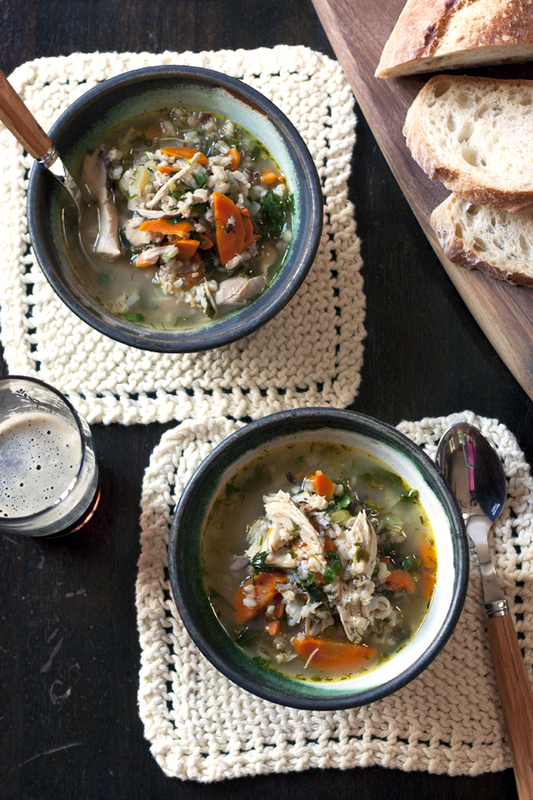 It makes a rich, smooth soup that's warm and mild, as pleasing as a warm bed on a cold morning. It is also surprisingly simple for how good it is. The recipe derives from a recipe in The Joy of Cooking, the old classic cookbook (incidentally one of the first Christmas gifts my husband ever gave me; that first copy disintegrated about a decade ago). Cook the onion and the garlic in the butter-water mixture over medium-low heat until the onions are very soft (but not burnt or browned), about 10 minutes. Add the carrots, cauliflower, and stock or broth to the pot. Bring the soup to a boil and then reduce to a simmer. Let the vegetables simmer until soft, about 15-20 minutes. Add the cream and parsley to the soup and season with salt and pepper to taste. Serve the soup hot with toasted bread and cheese for a nice winter meal. Also, if you have any leftovers, this is a good soup to pack for a school lunch with some crackers.